From his recent study on peatlands Dr Paul Lunt from Plymouth University explains how these landscapes are the world’s best long term biological carbon stores. Long-term storage of carbon matters to us all if we want to reduce future climate change. Photosynthesis is one route, and the amount of forest cover worldwide gets lots of attention. But this neglects another vitally important biological carbon store - peat. Peatlands only cover 3% of the Earth’s land area but are by far the most significant long-term stores of organic carbon. They hold twice as much carbon as all of Earth’s forests combined. In total, carbon in peat is equal to ~1800 gigatons of CO2, or over half of the total in the atmosphere. Our Environmental Science, Dartmoor Mires Team at Plymouth University probed the carbon capacity of peatlands on Dartmoor. In the west of Britain rainfall totals in the uplands result in saturated soils with limited oxygen availability. This is where peat forms, as an accumulation of a surface layer of un-decomposed wetland vegetation. Over time peat deposits become deep where the growth of vegetation outstrips the rate of decomposition. The uplands of Dartmoor with cool, wet and long growing seasons have particularly high rates of plant growth and carbon sequestration. For a Creative Associates Project promoted by the university, we worked with Real World Visuals to show the carbon sequestration in peatlands. As a colourless, odourless gas, CO2 is difficult for the public to visualise, and peat accumulation cannot be readily observed above ground. The challenge was to produce a video that would capture the imagination of the public and landowners. And we wanted to allow policy makers to see the significant long-term opportunities that upland areas, like Dartmoor, can offer for carbon capture and storage. The project draws on a paper currently under review in the Journal Geoderma. The data was collected over six years by Masters students from the MSc Environmental Consultancy programme (Figure 1). The research site was Fox Tor Mire, 4 km south-west of Princetown - a site better known for providing the inspiration for Grimpen Mire, in the Sherlock Holmes story The Hound of the Baskervilles (Figure 2). 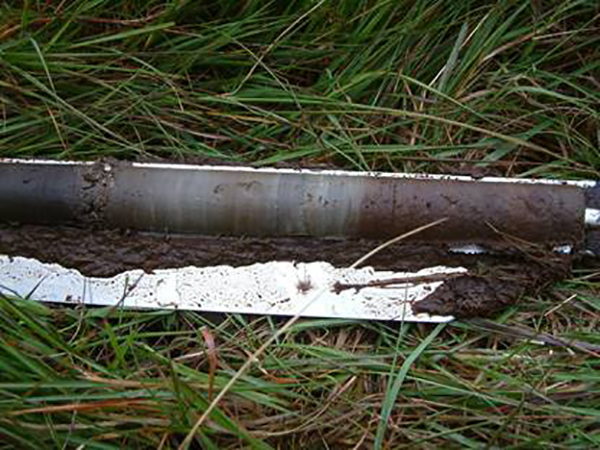 We took peat cores and depth measurements across the mire to find the rate of peat accumulation, going back to 1876. Accurate dating of cores was possible because the site is in a valley basin below the ancient Whiteworks mine site. Fox Tor Mire was cut for peat prior to the 1850’s, creating a pool filled basin which became a dump for fine alluvial china clay from the mine. Mining stopped in 1876, leaving a distinctive white colouration in the lowest segment of peat cores (Figure 4). The top of this whitish zone provided a date marker of 1876. All subsequent peat growth occurring between 1876-2011. Measuring the carbon and CO2 content of these cores provided the data used to make the video. Figure 4. Peat core with white china clay deposit centre. The picture shows peat above (RHS) and below (LHS). This is a gravel layer from tin mining. Followed by the white china clay. You can see a distinct transition from the white to the dark brown of the peat above and a good marker for the year 1876. That depicts the mean rates of annual sequestration we found 1.1 kg CO2 per m2 (Figure 5). This produced an average rate of peat growth of 9.5mm per year, which over the 134 years resulted in peat 127cm deep (Figure 6). Over the entire 58.3 hectare peat mass at Fox Tor Mire this depth holds the equivalent of 88,000 tonnes of CO2 gas. The video shows as the volume this would occupy as pure CO2 at 1 atmosphere pressure and 27oC. So we see how a significant sink of CO2 is stored in a relative small area, which if free in the atmosphere would occupy a space 2,500 times this size. To give this figure context this amount of CO2 over 134 years is equivalent to the annual present day carbon footprint of ~8,800 UK citizens - taking the carbon footprint for the average British citizen as ~10 tons CO2 equivalent per year (Figure 7). Figure 7. Total volume of pure CO2 gas captured and stored at Fox Tor Mire since 1876, representing 88,000 tonnes over 134 years. Fox Tor Mire has just 1% of the 8,000-10,000 hectares of deep peat (more than 40cm) in Dartmoor National Park. If peat growth continues to occur under future climates, then globally peatlands are the most significant and cost effective long-term and large scale option for CO2 capture and storage. Thank you to the research students from MSC Environmental Consultancy who helped with the collection of the data. Thank you to the Sustainable Earth Institute for their support.